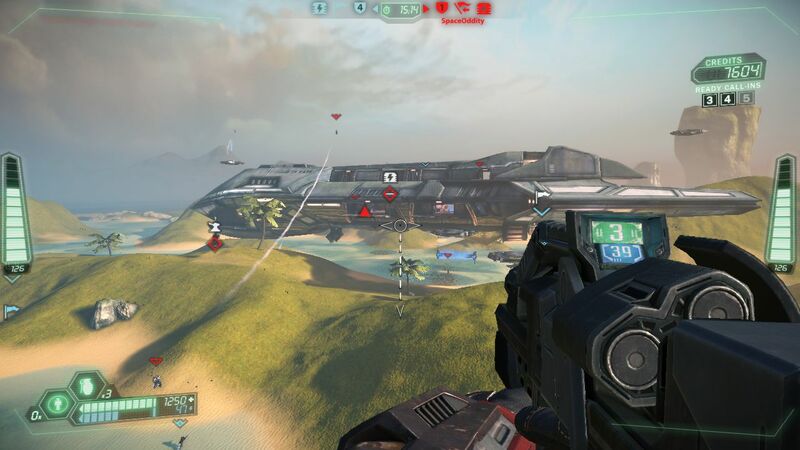 Tribes: Ascend is a game about one thing: speed. 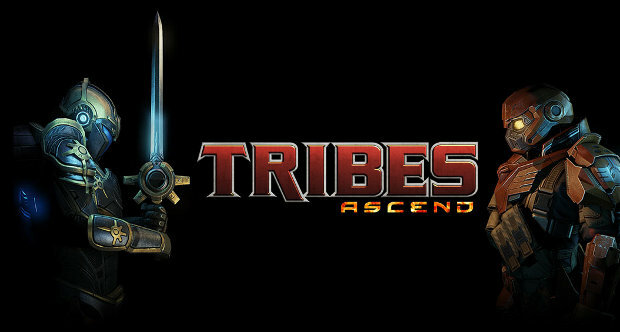 Tribes: Ascend is also a game about one thing: precision. Shall we throw another one in there? Okay – it’s also about teamwork. If your team is missing one of these things you won’t get very far. And these three things – speed, precision, and teamwork – say a lot about the game, its successes, and even its problems. To get the basics out of the way, Tribes: Ascend is a team-based online first-person shooter on the PC that is completely free to play. There are four game modes available – two varieties of team deathmatch, Capture & Hold (which is all about two teams competing to hold capture points), and good old reliable Capture the Flag. Each player has access to nine different classes (though only a select few are available at first), each with its different style of play, and a good team will field a balanced mix of offensive, defensive, and support classes to ensure victory. Let’s talk about speed. What sets Tribes apart from other shooters is its emphasis on allowing the players to move very, very fast. Players have access to two things – a jetpack and a special friction-dampening device that no one could fail to fall in love with. The first lets you quickly move up and the second let’s you move quickly down. Hold down the spacebar and, due to the removal of friction, any time you’re going down a slop you’ll pick up speed, as well as maintaining that speed on a flat plane. This is called skiing, and it’s fundamental to the playing of the game. What’s the jetpack useful for, then? Well, the giant, sprawling maps in Tribes: Ascend are cleverly designed labyrinths of gentle slopes, and jutting hills, and since gravity still applies anytime you go up a hill you’ll start to lose momentum. The jetpack, with its limited-use, slowly-recharging energy reserve, allows you to get up hills without sacrificing speed. At first all this can be very confusing, but soon you’ll start to learn the lines of the maps – where to use the topography to build up speed, and how to climb the steep hills without slowing down. Eventually you’ll be skiing and jetpacking your way to speeds of kilometres an hours speeds on a regular basis. And unlike other games speed is vital in Tribes for several reasons. First, you’re harder to hit when you’re careering at two hundred and fifty kilometres an hour down the face of a cliff. Second, in capture the flag, the real meat of the game, you’ll need speed to take the enemy’s flag without getting torn to pieces in the attempt. That’s also where precision comes in – in order to hit enemies with any reliability you’ll need to be precise. When you and your enemy are both jetpacking through the air at breakneck speed things becomes a little more complex. This can cause problems at times, since people who have practiced the game a great deal will become all but untouchable in open combat. But not only do you have to be precise during combat, but if you hope to take the enemy’s flag from right underneath them you’ll have to control your movements with utmost care. The only smart way to take an enemy flag is at hundreds of kilometres an hour, since at lower speeds you’ll be overtaken and killed with little effort. But inertia plays a big part in Tribes , and so you can’t hope to zoom into the enemy base, turn on a dime, and zoom out again. If you want to take the enemy flag you’ll have to be precise – you’ll need to hit that flag and get out without a hitch. And when you do it’s an amazing feeling. Zipping past enemy defences, dodging gunfire all the while, before taking the flag and then getting the hell out of there before anyone can react is one of the most exhilarating things I’ve ever done in a multiplayer game. And the sense of accomplishment for lining up everything perfectly is huge. It’s actually really astounding, and it’s only made better by the fact that getting the flag is extremely difficult. Players will have access to mines, auto-turrets, and forcefields to use to defend their flag stand. And the game’s defence classes are also formidable barriers when they’re played well. There are nine classes – three light classes, whose armour allows them to reach the highest speeds, three medium classes, and three classes with heavy armour and even heavier guns. Each plays differently, and can contribute to their team in various ways -from base defence and repairing auto-turrets and sensors, to flag-capturing and base-disruption. The back and forth game here is perfectly balanced when everything works together well. When two teams are equally matched it leads to some of the most tense, exciting experiences I’ve had with a game in recent years. But it all tends to fall apart when one team outmatches the other. And since a huge number of players don’t put much effort into teamwork this actually happens a fair amount. And while you might think it’d be unfair to blame the game for bad, obnoxious players Tribes: Ascend has to take its share of the blame since it simply doesn’t do enough to encourage people to play the game as a team-player, which is absolutely vital. When a game has a bad community it can’t be ignored. Even if you’re a really great player you will lose games often, and badly, because your team is simply not helping. Tribes: Ascend is a very complex game, and in order for your team to do well everyone has to be helping out. But Tribes is full of badly behaved, obnoxious players in a way that many other multiplayer games are not. And this affects the experience of playing the game a great deal. The issue of unbalanced matches is a real problem, and it needs to be addressed by Hi-Rez Studios, but my major hangup with Tribes: Ascend is actually far more removed from the minute to minute action. 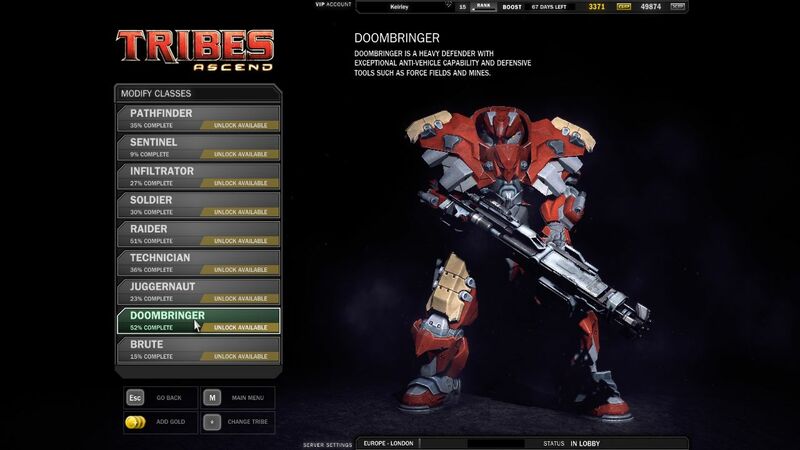 See, Tribes is free-to-play, and that means you can download it and play it as long as you like without paying anything. Instead, the game brings in revenue by charging players for optional in-game purchases of experience boosters and new gear. You can unlock all weapons and armour by spending the experience gained in the game, but the rate of experience gain is so glacially slow (especially for players who haven’t made any in-game purchases) that it could take weeks of serious daily play to unlock a single new weapon, even if you’re a pretty capable player. And this wouldn’t be a problem if the unlocks were simply fun alternatives to strong default weapons. But unfortunately many classes are at a marked disadvantage if they’re lacking certain premium equipment. It’s not exactly pay-to-win, but it’s certainly a problem. And not only do you gain experience extremely slowly, but the cost of in-game gold is actually kind of insane. In order to unlock all the guns for a single one of the nine classes you could easily pay over thirty pounds. So you’re kind of stuck – if you want better gear you’ll either have to spend weeks grinding up experience, or you’ll have to take the plunge and spend great deals of cash. Neither is a particularly exciting thing to find yourself doing. Admittedly, in recent months Hi-Rez Studios have done much to reduce both the experience grind and the real-money cost of unlocks, but if you’re expecting a game you can play seriously without paying anything at all you’ll be disappointed. But perhaps it’s unfair to hold this against Tribes: Ascend too much. The business model is questionable, and at its worst it can be extremely frustrating to regularly see two teams, one of Davids and one of Goliaths, come up against one another, especially when the Goliaths win over and over again. But all that aside, and as I said Hi-Rez Studios are making good, important strides to counter these issues, Tribes: Ascend is a wonderfully balanced, intense shooter that’s brimming over with intelligent ideas and fun mechanics. It’s Capture the Flag mode is, at the best of times, some of the most fun I’ve had in any game. And when you consider that this is completely free to play that kind of boggles the mind. Also, if you ever get tired of skiing and jetpacking around the map, picking up the enemy flag, and then returning it to your own base in a blaze of glory…then you’re tired of life. There’s nothing quite like it, and to be perfectly honest there’s nothing quite like Tribes: Ascend. This entry was posted in Games Blather and tagged free-to-play, Hi-Rez Studios, Review, Tribes: Ascend. Bookmark the permalink.